Hyundai Motor India Ltd (HMIL) has released first design sketches of the forthcoming Hyundai Venue sub-compact SUV. As the SUV is slated to make its India debut next week on April 17, the company will also be revealing the Venue SUV on the global front at New York International Motor Show. The officially released design sketches reveal exterior as well as interior styling along with key details. Also, we have already seen some spy shots of the sub-compact SUV giving out some key information ahead of the debut. Hyundai Venue Aka Hyundai QXi Sub-Compact SUV: Expected Price, India Launch, Features & Engine Specifications - What We Know So Far. 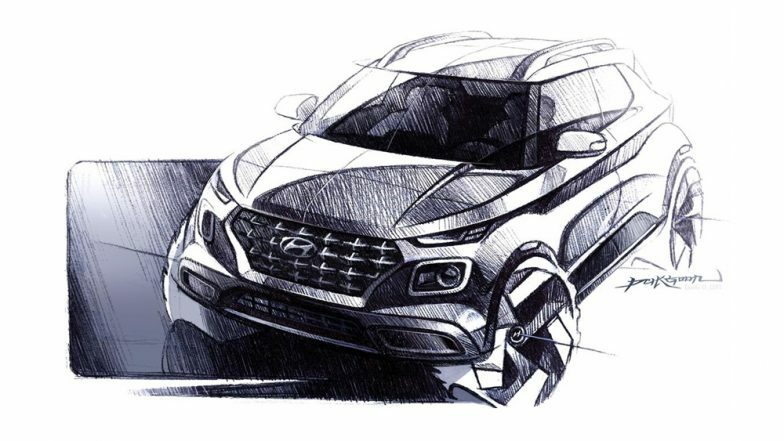 Going by the design sketches, the exterior of the sub-4m SUV is inspired from Kona SUV featuring a cascading grille, bumper mounted headlamps, sleek turn indicators, roof rails and sharp shoulder lines. The SUV will be seen carrying 16-inch alloy wheels. At the rear, the SUV gets a squarish tail lights that visually enhances the boxy design. Coming to the interiors, the design sketches shows dual-tone shades whereas the spied car features all-black cabin. However, the overall layout of the cabin remains the same to the spy shots we saw recently. It is believed that the car maker might be looking to keep all-black interior for the Sport variant whereas the dual tone paint scheme could be seen on lower variants. Hyundai QXi Aka Styx Sub-Compact SUV Christened As Hyundai Venue; Maruti Vitara Brezza Rival To Be Unveiled on April 17, 2019. The sketches also reveals that Venue will sport re-styled gear knob, an 8-inch floating touchscreen infotainment with Apple CarPlay and Android Auto compatibility, auto AC controls, rear AC vents, Sunroof, rotary dial behind gear knob and much more. The car maker is all set to launch the new Venue SUV in India by May 2019. As far as the prices are concerned, the SUV is expected to be priced in-between Rs 8 lakh to Rs 12 lakh (ex-showroom). Moreover, the new sub-compact SUV from Hyundai will be seen in petrol as well as diesel avatars with manual and automatic transmission options. When launched, the newest offering from the Korean auto manufacturer will take on Ford EcoSport, Tata Nexon, Maruti Vitara Brezza and Mahindra XUV300.